Yesterday was a big day for Earth imaging, as NASA’s Landsat Data Continuity Mission (LDCM) successfully launched into orbit from Vandenberg Air Force Base in California. Exelis VIS’s own Thomas Harris (@t_harris) was lucky enough to attend the NASA Social event at the launch. Check out his twitter stream from that event to catch a whiff of the excitement on the launch pad. After the about 100 days of commissioning time and a final check, the USGS will make nominal data products from Landsat 8 available to all users at no charge. As the USGS takes over operation of the satellite, it plans to rename the mission Landsat 8. Plenty of folks in the Remote Sensing community had reason to bite their nails as the LDCM launch date neared. In 1993 Landsat 6 launched but then failed to reach orbit due to a ruptured manifold. While Landsat 7 successfully launched in 1999, the Scan Line Corrector in Landsat 7’s ETM+ instrument failed permanently in 2003. This left ETM+ incapable of collecting more than about 75% data for any given scene. Therefore, when Landsat 5 was decommissioned this past January 6, after an amazing 28 years of service, that left us with no fully functional Landsat sensor. Continuing the Landsat mission has been a top priority for the remote sensing community. For over 40 years now the Landsat Program has been continuously collecting multispectral imagery of the Earth. Continuing that record into the future is critical for a wide variety of objectives, including cartography, urban planning, disaster response, and natural resource monitoring. 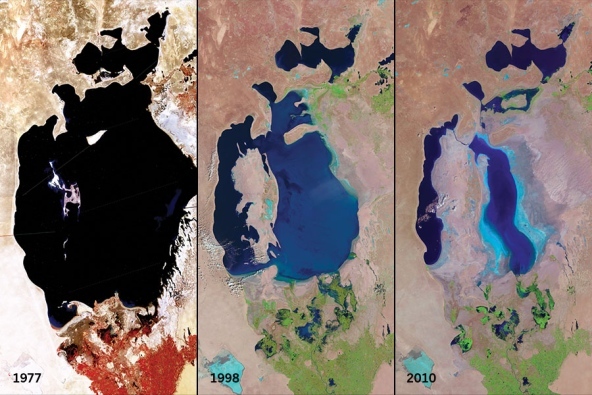 Landsat images show the Aral Sea in central Asia shrinking significantly from 1977 to 2010 because of water diversion for agricultural use. Images provided by USGS EROS Data Center. Image compilation prepared for Nature. Landsat 8 carries two instruments, the Operational Land Imager (OLI) and the Thermal Infrared Sensor (TIRS). The OLI will add two new bands to previous Landsats’ visible, near infrared, and shortwave infrared measurements. One is designed to collect data about high altitude cirrus clouds and one to collect data about aerosols and water quality in lakes and shallow coastal waters. TIRS will collect data on heat emitted from Earth’s surface in two thermal bands, as opposed to the single thermal band on previous Landsat satellites. What do you think the impact of Landsat 8 data being on your remote sensing, GIS, and geospatial products will be? This entry was posted in Environmental Monitoring, Remote Sensing and tagged etm, Landsat, landsat 8, landsat data continuity mission, LDCM, multispectral, NASA, operational land imager, remote sensing, thermal infrared sensor, USGS. Bookmark the permalink. 1 Response to Landsat 8 is Up and Away!